Despite the widespread use of images of cows in fields, labels on milk tell you very little about the farms your milk comes from and the life that the cows are afforded. Traditional British dairy farms are disappearing from the landscape at an alarming rate, to be replaced by larger, more intensive operations where cows are sometimes confined indoors all year round. The number of dairy farms in England & Wales has halved in the last 15 years, leaving just 9,524 in business in August 2016. However, during this same period, total milk output has continued to rise as milk yields increase. Today dairy cows produce an average of 7,912 litres of milk each year, an increase of almost 25% in the last ten years. These figures highlight a shift towards fewer, larger herds producing our milk from an increasingly intensive farming regime. It is now estimated that around 20% of dairy cows never go outside. Whilst many perceive milk as simple ‘white stuff’, the milk that comes from each individual farm will have distinct qualities and taste. But, unfortunately the ‘terroir’ of milk is lost as big dairies pool milk from thousands of different farms, stripping it of its provenance. This means that whilst many cows are still grazed in fields, milk from these farms is blended with that from herds with little or no access to grazing. There is increasing evidence to show that the nutritional value of milk is, perhaps not unexpectedly, determined by what the cows eat. Analysis of milk samples from herds where there large quantities of grass and forage are fed found higher levels of Omega-3, Conjugated Linoleic Acid (CLA) and other healthy fats, than those in milk from cows fed high levels of grain. People are beginning to wake up to the fact that not all milk is the same. But, right now it is very difficult to make an informed choice about where your milk really comes from. 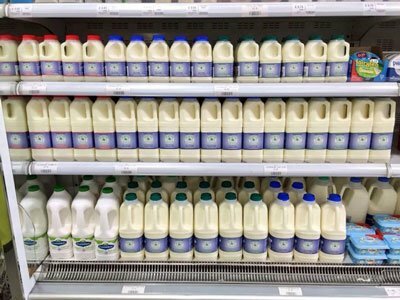 Images of cows in fields in supermarket aisles and on milk bottles do NOT mean that the milk you are buying is free range. But, Free Range Dairy Network is leading to a campaign to help you make that choice. The farmers and dairy companies we work with are putting the Pasture Promise logo on their milk to give you a clear assurance that their milk comes from cows grazed in fields for at least 180 days a year. There is no legal definition of Free Range Milk and so we want to make sure that it means more than a token gesture to grazing cows. The Pasture Promise logo represents a clear commitment to keeping cows in fields for at least 180 days a year and is backed by a set of Producer Standards. These standards are independently assessed, to ensure each farm makes a clear commitment to keeping cows in fields and delivering you great tasting milk. In return we are asking you to pay a small premium for the milk to help keep Free Range Dairy farms in business.